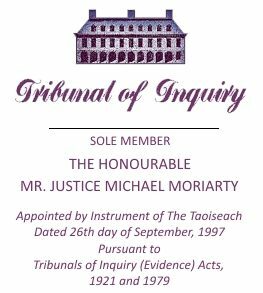 CHAIRMAN ( MR. JUSTICE MORIARTY): The primary purpose of this morning’s second public sitting of the tribunal, as indicated in the advertisement notifying its sitting, is to indicate pursuant to the recent judgment of the Supreme Court affecting the tribunal, the current interpretation on the part of the tribunal of its Terms of Reference. 1.1 Term of Reference (a) embraces substantial payments made directly or indirectly to Mr. Charles Haughey in circumstances giving rise to a reasonable inference that the motive for making the payment was connected with any public office held by him or had the potential to influence the discharge of such office. What substantial payment means in this context is having material significance either by reference to the value, i.e. the amount of any payment or by reference to other considerations, some of which are set out below. 1.2: The material significance of the amount of any payment will depend on the time at which the payment was made so that the size of a sum of money which now appears to be small should in fact be judged by reference to how large it may have seemed at the time it was paid. 1.3: Therefore, whilst a payment in the amount of £500 or £600 may not seem large now or so large as to be substantial, the same could not be said of a payment made in 1979. All the same, such a payment depending on the resources of the person by whom it is made and the motive with which it is made could be substantial. 1.4: Moreover, whilst a single payment in the amount of £500 or £600 might not be sufficiently large in today’s terms to be regarded as “substantial”, a number of payments of that amount from the one source over a short period of time or a number of related payments or concerted payments from a number of different sources might amount to such a substantial payment. (6) The resources of the person receiving the payment. 1.6: Term of Reference (a) applies to any substantial payments made to Mr. Charles Haughey at any time within the period 1st January 1979 and 31st December 1996, inclusive. 1.7: There is no such similar time limit applicable to the bank accounts referred to in Term of Reference (b). This is not to say that the tribunal anticipates being able to examine or that it should take into account each and every bank account of Mr. Charles Haughey or any other person whose bank account may be relevant, in as much as it may be impossible to obtain accurate or reliable information or to adduce credible evidence in respect of any such material where it relates to a period which is too remote. This may arise, for instance, by reason of frailty of memory, absence of documents or otherwise in circumstances where the finding of facts based on available and information and evidence adduced would not be justified. Of course, this observation applies to any material that the tribunal may have to consider. 2.0: The tribunal envisages that having identified a payment, the circumstances in which the payment is made would be examined to see whether the inferences referred to in the Terms of Reference ought to be drawn. 3.0: Term of Reference (b) applies to monies held in the accounts known as” the Ansbacher accounts”. The “Ansbacher accounts” are the accounts described as those consisting of money held on deposit in certain Irish banks by offshore banks in memorandum accounts for the benefit of Irish residents, including Mr. Charles Haughey, the history of which is set out in chapter 6 of the Tribunal Report, colloquially referred to as ” The McCracken Report”. 4.1: This Term of Reference applies to any money ever held in the accounts for the benefit or in the name of Mr. Charles Haughey and also applies to any other account discovered by the tribunal to be for the benefit of or in the name of Mr. Charles Haughey. 4.2: This term of reference also applies to any money ever held in the accounts for the benefit of or in the name of a person who now holds or ever held ministerial office. 5.0: Term of Reference (c) embraces payments from accounts held in the name of or for the benefit of Mr. Charles Haughey under Term of Reference (b) to any person who holds or has held public office. It applies to all payments to any such person regardless of size but it does not necessarily follow that every such payment is one which would merit being classified with the type of payment falling within Term of Reference (a). 6.0: Term of Reference (d) seems to speak for itself as has already been suggested by Mr. Justice Geoghegan in his judgment in the High Court in the proceedings entitled “Haughey and others -v- Moriarty and others”, of the 28th April 1998. It applies only to acts or decisions of Mr. Haughey in the course of his ministerial offices. 7.0: Any reference to payments in the Terms of Reference includes payments in cash or in kind and payments consisting of the granting of any credit, discount or financial accommodation in circumstances amounting to the conferral of a monetary or other financial benefit. 8.0: The expression ” public office” in relation to Mr. Charles Haughey in Term of Reference (a) applies to every ministerial office held by him and the period comprised in the said term includes all periods during which he held ministerial office, commencing on the 1st January 1979, and periods subsequent to the holding of such office, up to the 31st January 1996, both dates inclusive. 9.0 So far as “connected persons” are concerned, what Term of Reference (a) means is that a connected person within the meaning of the Terms of Reference may become involved with the tribunal in the context of the tribunal’s obligation not to exclude from its consideration a payment which, although not made directly to Mr. Charles Haughey, may as an indirect payment to Mr. Charles Haughey, involve the discharge of monies or debts due by such a connected person. What this may involve, for instance, is the payment of a debt due by a connected person (as such) where the payment is made in a context that is discernibly referable to Mr. Charles Haughey. 10.0: Under Term of Reference (b), so far as “connected persons” are concerned, the tribunal is obliged to inquire into and report in connection with the source of funds in any accounts, other than the Ansbacher accounts discovered by the tribunal to be for the benefit of a connected person, with a view to establishing whether there is a context discernibly referable to Mr. Charles Haughey. 11.1: Term of Reference (e) embraces substantial payments made directly or indirectly to Mr. Michael Lowry in circumstances giving rise to a reasonable inference that the motive for making the payment was connected with any public office held by him or had the potential to influence the discharge of such office. 11.2: Term of Reference (e) applies to any substantial payments made to Mr. Lowry at any time when he held public office, meaning ministerial office. 12.0: Once again, there is no time limit applicable to the bank accounts referred to in Term of Reference (f). That is not to say that the tribunal anticipates being able to examine, or that it should take into account each and every bank account of Mr. Lowry or any other person whose bank account may be relevant in as much as it may be impossible to obtain accurate or reliable information or to adduce credible evidence in respect of any such material where it relates to a period which is too remote. This may arise, as already stated, by reason of frailty of memory, absence of documents or otherwise in circumstances where the finding of facts based on available information and evidence adduced would not be justified. As earlier stated, this observation applies to any material that the tribunal may have to consider. 13.0,: The tribunal envisages that having identified a payment, the circumstances in which the payment is made would be examined to see whether the inference referred to in the terms of reference ought to be drawn. 14.0: Term of Reference (f) applies to monies held in the accounts in the Bank of Ireland Thurles Branch, Thurles, County Tipperary; The Allied Irish Bank in the Channel Islands; The Allied Irish Bank, Dame Street, Dublin; The Bank of Ireland (I.O.M.) Limited in the Isle of Man; The Irish Permanent Building Society, Patrick Street Branch, Cork, or Rea Brothers, (Isle of Man) Limited. 15.1: This Term of Reference applies to any money ever held in the accounts for the benefit of or in the name of Mr. Lowry and also applies to any other accounts discovered by the tribunal to be for the benefit of or in the name of Mr. Lowry. 15.2: This Term of Reference also applies to any money ever held in accounts for the benefit of or in the name of any other person, who holds or has held ministerial office. 16.0: As with paragraph (d) of the Terms of Reference, paragraph (g) also seems to speak for itself as suggested by Mr. Justice Geoghegan in his judgment in the aforesaid High Court case, delivered on the 28th April 1998, when considering paragraph (d) of the Terms of Reference, which provision is identical to paragraph (g) in all material respects, with the exception of the party to whom it refers. It applies only to acts or decisions of Mr. Lowry in the course of his ministerial offices. 17.1: Term of Reference (h) embraces payments from accounts held in the name of or for the benefit of Mr. Michael Lowry under Term of Reference (f) to any person who holds or has held public office, meaning ministerial office. It applies to all payments to any such person regardless of size but it does not necessarily follow that every such payment is one which would merit being classified with the type of payment falling within Term of Reference (e). 18.0: Term of Reference (i) embraces payments from monies or accounts held in the name of or for the benefit of a person who holds or has held ministerial office under Terms of Reference (b) or (f) to any person who holds or has held public office meaning ministerial office. For the purposes of Term of Reference (b), these are confined to payments made from monies held in the Ansbacher accounts. 19.0: The expression “public office” in relation to Mr. Lowry in Term of Reference (e) applies to any ministerial office held by him. 20.0: So far as “connected persons” are concerned, what Term of Reference (e) means is that a connected person within the meaning of the Terms of Reference may become involved with the tribunal in the context of the tribunal’s obligation not to exclude from its consideration a payment which, although not made directly to Mr. Lowry may, as an indirect payment to Mr. Lowry, involve the discharge of monies or debts due by such a connected person. What this may involve, for instance, is the payment of a debt due by a connected person (as such), where the payment is made in a context that is discernibly referable to Mr. Lowry. 21.0: Under Term of Reference (f), so far as “connected persons” are concerned, the tribunal is obliged to inquire into and report in connection with the source of funds in any accounts other than the accounts, listed in Term of Reference (f), discovered by the tribunal to be for the benefit of a connected person, with a view to establishing whether there is a context discernibly referable to Mr. Lowry. 22.0: Paragraph (j) does not seem to require any explanation subject to any representation any person so authorized may wish to make. 23.0: This explanation of the Terms of Reference is not final and may be amplified or revised from time to time, either in the light of any representations made to the tribunal, or in the light of the manner in which the investigation develops, and indeed in the light of any evidence that may be given at public hearings. 24.0: Before passing on to outline some of the procedures the tribunal proposes to adopt, there is one further aspect of the interpretation of the Terms of Reference which should be mentioned. This concerns the investigative part of the tribunal’s functions. In performing this part of its functions, the tribunal envisages that in most cases, it will proceed from an examination of payments, (if any), within the ambit of Term of Reference (a), or the source of funds (if any), within Term of Reference (b), before going on to investigate whether Mr. Haughey made any act or decision within Term of Reference (d). In other words, it anticipates that it will proceed in performing its investigative functions from examining what appear to be “payments” (or “sources of funds”), if any, to investigating what might appear to be potentially related acts or decisions. At the same time, if any “act or decision” appearing to come within the ambit of Term of Reference (d) is brought (or comes) to its attention, then the tribunal would not be precluded, as part of its investigative function, from examining any such act or decision to see whether it came within Term of Reference (d), i.e., whether evidence was available, which was relevant to be led in public, indicating that there was a relationship to a payment within Term of Reference (a) or a source of funds within Term of Reference (b). 25.0: However, while the tribunal could in its report make findings of fact in connection with payments within Term of Reference (a) or sources of funds within Term of Reference (b) while finding that there were no related acts or decisions within Term of Reference (d), it would not be open to it to make a finding in relation to an act or decision except in the context of a prior finding of fact in relation to such a “payment” or such a “source of funds”. This also applies to the investigative part of the tribunal’s functions where Term of Reference (g) is concerned, i.e., “acts or decisions” of Mr. Lowry. 26.0: Dealing now with the tribunal’s procedures, the Supreme Court has described the role of the tribunal as investigative and has referred to the various stages involved in a Tribunal of Inquiry of this nature. The first two stages involve a preliminary investigation of evidence available followed by the determination by the tribunal of what it considers to be evidence relevant to the matters into which it is obliged to inquire. In performing its investigative role, it is the preference of the tribunal that its dealings with people should be on a voluntary and cooperative basis. (4) Material or information furnished to, or material or information coming to the attention of, the tribunal. 28.0: If persons do not wish to produce documents on a voluntary basis, or if the actual production of the documents cannot be secured, the tribunal would then advise the person in possession of the documents, and all persons who are likely to be affected by their production, of the intention of the tribunal to make an Order, subject to any representations or submissions that they may wish to make. It is the intention of the tribunal that this notice would again set out the basis on which the tribunal believes that the Order is necessary for its functions, and the material which has prompted the tribunal to seek access to the documents. 29.0: The tribunal would intend to give all such persons reasonable notice. The length of notice in any case would depend on the particular circumstances but as a general guideline, the tribunal would hope to give seven days notice to persons residing within the jurisdiction. Where persons are outside the jurisdiction, or are not represented by solicitors within the jurisdiction, the tribunal would consider a lengthier notice period. There may, of course, be circumstances where, due to particular facts, the tribunal believes that it is expedient and necessary for the purposes of its functions to provide a shorter notice period. 30.0: All persons to whom notice is given will have an opportunity to make representations or submissions to the tribunal regarding the making of the Order. If such persons wish to consent or otherwise do not wish to avail of their rights to make representations or submissions, they would be under no obligation to do so and could communicate with the tribunal in writing. Those who wish to make submissions would be entitled to make them in correspondence or orally to the Sole Member. If persons wish to make submissions in correspondence, they would be asked to do so prior to the expiry of the seven day period. If a person elects to make oral submissions, arrangements will be made for a private sitting of the tribunal. After giving due consideration to all submissions and representations made to him, the Sole Member would then and only then proceed to make an Order, if he considered it necessary for the purposes of his functions, and would state his reasons for so doing. 31.0: The next main stage of the inquiry, assuming that evidence relevant to the matters into which the tribunal is obliged to inquire exists, is the public hearing of witnesses in regard to such evidence. This stage, however, will require putting in place protections for people likely to be affected by the evidence. What the tribunal contemplates is serving notice on persons likely to be affected by any such evidence with an outline of the evidence, where possible. This will enable any such person to be in attendance when the evidence is being given. Where necessary, and subject to the matters set out at the tribunal’s initial sitting, such persons will have an opportunity of cross-examining any relevant witness. 32.0: It cannot be guaranteed that the tribunal will always be in a position to serve notice of an outline or indeed give any indication of the nature of such evidence. It may transpire that in the course of the public hearings, evidence is given of which the tribunal has no prior notice or knowledge. In such circumstances, in order to afford a person likely to be affected by such evidence an opportunity of considering what course to take, it may be necessary to adjourn the public sittings, or to take whatever other practical steps appear to be necessary to afford such a person an opportunity of dealing with the evidence. A person whose interests may be affected or have been affected by evidence, may wish to bring to the notice of the tribunal other evidence and in that event, the tribunal will consider such evidence and if appropriate, such evidence will be led by the tribunal in public. 33.0: The findings or conclusions of the tribunal will be based only on appropriate evidence given at its public hearings. 34.0: It appears to me that the balance of today’s sitting should be on the following lines. Firstly, any representations now sought to be made orally will be heard in relation to the interpretation of the Terms of Reference and the outline of procedures just mentioned. This is not to say that in particular cases, if any Order is made or if the tribunal gives notice of intention to make an Order, representations on procedure in relation to any such intention may be appropriate, depending on the circumstances and will be received by the tribunal from any person likely to be affected. Any person who has already obtained authorisation to be represented at the tribunal will be at liberty to make any representations in relation to the interpretation and outline of procedures. Where a person has not obtained such authorisation, an application for authorisation will be entertained now after a very short adjournment, either limited to making representations in relation to the terms of reference or in relation to the procedures or generally as the case may be. Accordingly, a short adjournment will now be granted to enable practitioners or other personnel to approach the registrar, Ms O’Connell, to indicate an intention to make an application for authorisation to be represented followed by the hearing of any representations in relation to the explanation of Terms of Reference and/or procedures on the basis of what has been stated in the course of my remarks. I appreciate, ladies and gentlemen, that the above matters are relatively detailed and may indeed require some time to digest and be considered so I am certainly not seeking to thrust upon any person any immediate requirement of making submissions after the short recess. I also appreciate that for members of the media, it may be difficult to have taken all the matters that have been stated immediately and I can assure those persons of the full cooperation of the tribunal staff and personnel in facilitating the availability of the written transcript or other record of the matters dealt with at the earliest possible vantage point later today. Accordingly, ladies and gentlemen, I propose to adjourn for just some ten minutes, at most, to enable positions to be finalised in relation to representation applications and any question of submissions or other applications that may, thereafter, arise. CHAIRMAN: Perhaps we can now proceed to deal with any matters of representation or submissions that may arise and whilst I don’t wish, ladies and gentlemen, to be repetitious of any matters that were stated by me at the initial public sitting of the tribunal, I should, of course, be at pains to point out to any person who may be seeking representation that the grant of either a full or limited representation at this juncture in no sense constitutes any guarantee in relation to any eventual costs application that may fall to be made at the conclusion of the inquiry’s business. Very good, are there any applications that now arise? MR. TURLOUGH O’ DONNELL: Sir, I appear with Mr. Gerard Charlton instructed by Messrs. Reddy Charlton and McKnight. MR. TURLOUGH O’ DONNELL: If I could make an application, Sir, for representation on behalf of Sean, Ciaran and Conor Haughey and Mrs. Eimear Mulhearn, that’s an application, Sir, for representation generally before this tribunal and if I could also, at this stage, say that I would wish in the event of representation being granted to me, Sir, to reserve my position in relation to any submission as to the tribunal’s interpretation of its Terms of Reference. CHAIRMAN: Yes. Very good, Mr. O’Donnell, it seems to me insofar as your clients are named as connected persons and in the context of what has already transpired in the course of the tribunal’s business and in the context of what was stated in the McCracken Report, it appears to be clear that you are entitled to such representation. I propose as you seek to make it in general terms, Mr. O’Donnell, but it does seem to me there may be portions of the eventual sittings that may have only the most marginal connection with your clients’ interests and in that context, I would advise you to liaise with the legal members of the tribunal team to avert any needless involvement in relation to those parts but I will make it a general grant of representation with the observation that it would seem that in portions of the sittings that may have no relevance to your clients, it may be feasibly arranged you need not be troubled on those occasions. As regards the other matters, it is clearly set forth in my earlier remarks that I am not expecting submissions on foot of the construction of the terms and what may be called the procedural arrangements notified this morning, to be in a position to make any full or immediate submissions and I, of course, accept that you should be in a position either orally or in writing to make submissions in due course on any such matters on the construction of the Terms of Reference that may arise. MR. TURLOUGH O’ DONNELL: I understand all that Sir. I am obliged to you and I will liaise in due course as suggested. CHAIRMAN: Very good Mr. O’Donnell. Thank you very much. MR. KARL HAYES: Sir, Gore and Grimes solicitors on behalf of Mr. John J. Stakelum seeking limited representation for the tribunal. Mr. Stakelum has been requested to offer assistance to the tribunal and he has done so and is prepared to do so but it is proposing a heavy burden on him in times of work and I have taken note, Sir, about your observations of costs but in the previous McCracken tribunal, the learned Chairman held at the conclusion he had no power to grant costs to whom representation had not been granted so to be in a position to make an application — at the conclusion of this tribunal, we are seeking representation on behalf of Mr. Stakelum. CHAIRMAN: Yes. Well again it seems to me you are entitled to that Order for limited representation on behalf of Mr. Stakelum and I make such an order and Mr. Hayes and as I stated a few moments ago, this is not to be interpreted as being any guarantee of any eventual costs application but I note what you state and that aspect will simply have to be dealt with on its merits at such later vantage point. MR. HAYES: Thank you, Sir. MR. BRIAN O’ MOORE: I appear instructed by O’Connor & Company in Naas and we appear on behalf of Mr. Sam Field-Corbett, Mr. Field-Corbett is a gentleman again rather like Mr. Stakelum is known to the tribunal, he was written to in February of this year by the tribunal solicitor and he has attended a number of meetings with the tribunal and sought to assist the tribunal in its inquiries. I should say Mr. Field-Corbett’s name emerged during the evidence before McCracken Tribunal which you have already indicated will be a primary source of the inquiry of this tribunal. He is mentioned obliquely in the report of Mr. Justice McCracken. The inquiries made to the tribunal team to Mr. Field-Corbett were very wide-ranging and the letter sent on the 26th February 1998 to my client makes inquiries on a large number of issues in connection essentially with corporate & company affairs. Mr. Field-Corbett, again similar to Mr. Stakelum’s position, is an individual. He does not take any presumption in connection with costs of assisting the tribunal or appearing before it but he wants to be before the tribunal for two respects. First of all, if there were to be significant level of costs occurred, he would make appropriate application to you, Sir, on the merits and secondly, because in the light of information he has been able to give the tribunal, there’s the possibility that his evidence may be contradicted by other persons and he seeks to be represented on that issue and also because since the tribunal began its sittings, there has been identification of Mr. Field-Corbett in the press as somebody involved centrally in the affairs of Mr. Haughey or Mr. Traynor. Now Mr. Field-Corbett says that that simply isn’t correct but that information and that suggestion is coming from somewhere and for that reason I think it’s appropriate at this stage that limited representation be granted to him before you, Sir. CHAIRMAN: Yes. Very good, Mr. O’ Moore, I note all the matters you state and it seems to me that many considerations similar to the position vis-a-vis Mr. Stakelum arise and I accede to your application for grant of limited representation and note the circumstances that you relate to. MR. BRIAN O’ MOORE: I should say in connection with what the tribunal said this morning, Mr. Field-Corbett has no submissions to make and I would reserve my position. I am quite happy to make no submission on the matters outlined this morning. CHAIRMAN: Thank you. Very good. No other applications? MR. PAUL GARDINER: I appear on behalf of Mr. Charles Haughey, instructed by Ivor Fitzpatrick & Company, I am not seeking representation limited or otherwise but I do wish to express to reserve Mr. Haughey’s position in relation to the matters discussed this morning, the Terms of Reference and the procedures. I understand the tribunal is aware of that position. CHAIRMAN: Certainly, Mr. Gardiner, I note your interest and your retention on behalf of Mr. Haughey and of course it will be open to you to take such steps either orally or in correspondence as you may think fit on foot of your instructions and again I would invite you to liaise with the legal members of the tribunal team and I thank you for your attendance. Very good, no other applications or submissions at this juncture? Nothing, Mr. Coughlan arising? CHAIRMAN: Very good. Then, ladies and gentlemen, it seems then we are very close to the end of the sitting, I have no wish to go into any internal matters of the tribunal’s workings and it would be inappropriate if I do so. Accordingly, I do not propose at this juncture to nominate a definite starting date for public sittings, save to note that one or two speculations which I have casually heard of as regards rather protracted or pessimistic deferrals appear to me not to reflect the very genuine commitment that I and the members of the team have to proceed with public sittings as soon as it feasible and realistically possible and that will be my undoubted intention and an announcement will be made in due course so that no parties or other personnel relevant will be taken by surprise. Similarly, because the vast bulk of the works carried out by the tribunal to date have pertained to its private stage of confidential inquiry, it would be quite wrong for me to seek to enumerate or set forth the nature of those works. In due course, they will be accounted for in the event report of the tribunal and I believe it will be shown that the tribunal and its legal members have not been inactive or torpid during the period of deferral and I should also point out, lest there be any doubt about it, that as part of the duties and indeed as an immediate priority in very recent weeks, the words of the Supreme Court have been most promptly and meticulously complied with as an absolute priority. There being no other matters that seem to arise, ladies and gentlemen, then we will conclude this morning’s sittings and an announcement will be made of a resumption of public sittings at the earliest feasible vantage point. Thank you very much. THE TRIBUNAL WAS THEN ADJOURNED.